Leslie David Braxton, D.Min., M.Div., B.A. were spent in the Great Northwest, in the city of Tacoma, Washington. He was baptized at the age of six at his home church, Bethlehem Baptist. 1987-1999, First Shiloh Baptist Church of Buffalo, New York. 1999-2005, Mount Zion Baptist Church of Seattle, Washington. Doctor Braxton regularly preaches revivals and special occasions, and facilitates workshops for churches throughout the nation. 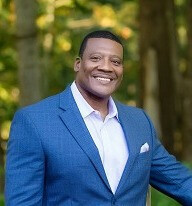 He is also a frequent speaker and presenter on college and seminary campuses. Doctor Braxton is an avid promoter of social justice, educational excellence, physical and emotional health and well-being, and community involvement. Doctor Braxton is a 2000 inductee to the prestigious Morehouse College Board of Preachers. He is a member of the Evangelicals for Middle East Unity (EMEU). And currently serves as President of the Congress of Christian Education for the North Pacific Baptist Convention. Doctor Braxton is married to his hometown sweetheart, the former Shelia Denell Stubbs. The two are blessed with one daughter, Karissa, 2014 graduate of Howard University in Washington, DC (B.A. Broadcast Journalism and Political Science). They also have a son, Samuel, 2016 graduate of Morehouse College in Atlanta, GA (B.S. Kinesiology). Doctor and Mrs. Braxton are also the former guardians of a nephew, Ramon Bryant Braxton, a graduate of both Morehouse College (BA, Music Theory) and Morgan State College (MA, Music Theory). Shelia is the love of my life. Karissa is the darling of my life. Samuel is the pride of my life. Ramon is the Privilege of my life. But JESUS is the center of my joy.